Candles burning in an interior add warmth. They make the scene more inviting. They are an uncontrollable pain to shoot. So I never shoot burning candles in an interior. I do ask permission to light them. Don’t assume that it’s OK to light candles that happen to be in a room you are shooting. They may be just for decoration and replacing them with new ones can be problematic. Once I’ve lit a candle and the wick has blackened I blow it out. Why? Adding flame to unlit candles looks weird and wrong. I’ll show you one later so you can see what I’m saying. Candles on a dining room table waiting to be lit in Photoshop. 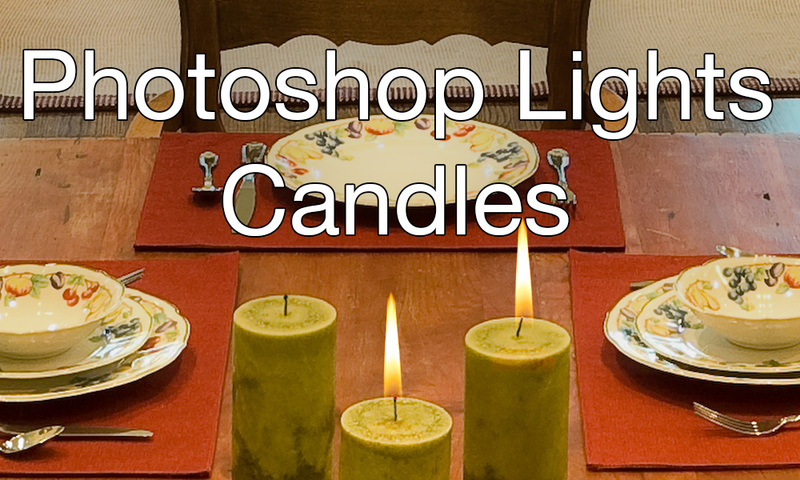 Open an interior with unlit candles in Photoshop. Now open a photo of a burning flame too. A recent post of mine here on Photofocus, explains how to photograph a lit candle in a controlled setting. In Photoshop, tap the V key to choose the Move tool in the toolbar. If your flame has more than one layer, highlight the appropriate ones in the Layers panel. Click inside the flame photo (not the layers) then drag it to the tab holding your interior. When the interior appears, drag the cursor into the photo. Release the mouse button to copy the flame into the interior as an new layer. If you want it centered, add the Shift key before releasing the mouse. A screen shot show the flame almost ready to light the candles. The flame against a black background and in the interior with candles to be lit. Normally this is where you are told “use your favorite selection tool to pull the flame off of the background.” Bother. This is much easier. Anytime something is photographed against a totally black background, change the layer’s blending mode to screen and the black disappears!. The Screen blending mode makes black transparent. Highlight the flame layer. Press Command (WIN: Control) + T or choose Edit > Free Transform. Click inside the bounding box. Drag the flame to one of the candles. Center the glowing wick on the end of the wick to be lit. Drag the anchor in the center of the image to the glowing wick. Next, Hold down the Shift key to keep the height and width proportional. Add the Option (WIN: Alt) key to make the transform happen around the anchor point. Click the Commit check mark in Photoshop’s Options bar to apply the transformation. Size the flame’s wick centered on the candle’s wick. The flame layer is still highlighted in the Layer stack. The Move tool is still active in the Toolbar. Hold down the Option (WIN: Alt) key. Click in the flame then drag it to an unlit wick. Repeat to light all the candles. This technique keeps the candles brand new no matter how long the photography takes in real life. Even if you could burn the candles and photograph them in the interior, they’d never look this fresh. As promised, here’s why you want to burn the candles being photographed until the wicks darken. As I said it look very weird and totally wrong! Light the candles first to avoid this crazy look. Shoot some bonfires. This technique works to light fireplaces too! Photography is life. Kevin is living it to the fullest. His practice includes fashion, editorial, architectural and corporate photography. Most of all he loves making photographs! Read his blogs here and at www.kevinamesphotography.com.